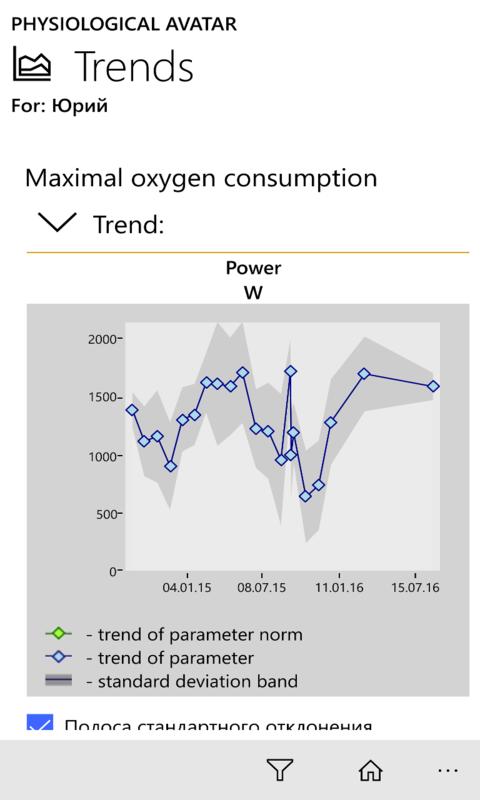 We present a software application for the desktop platform of universal Windows 10 applications (UWP), as well as for Android and iOS mobile platforms, implementing simulation and training management technologies in any cyclic sports based on the Physiological Avatar technology. 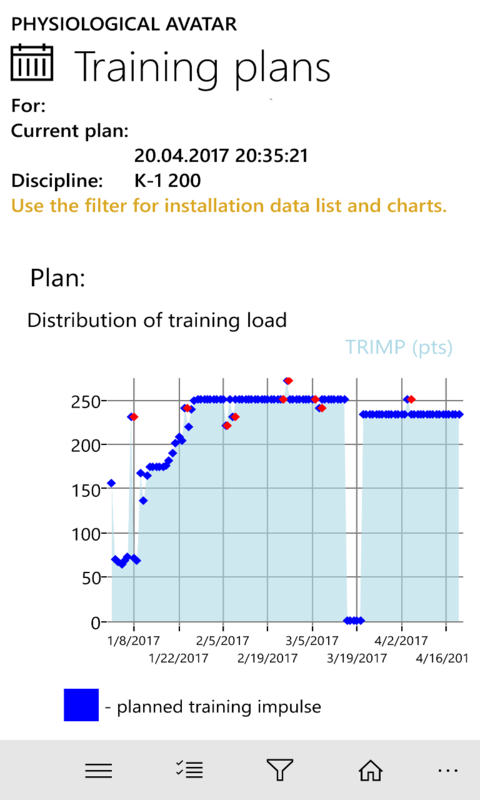 The application implements a new integrated system for modeling and managing the training process as a whole and a separate training exercise based on a unique synthesis of Physiological Avatar technology (PhA) and Training Impulse technology (TRIMP). 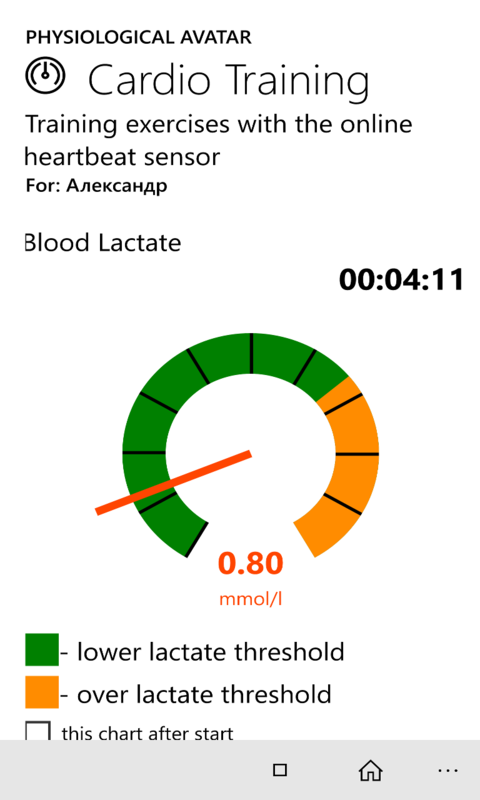 The application is intended for professional trainers and sportsmen in any cyclic sports that want to use the latest achievements of sports science in their work. 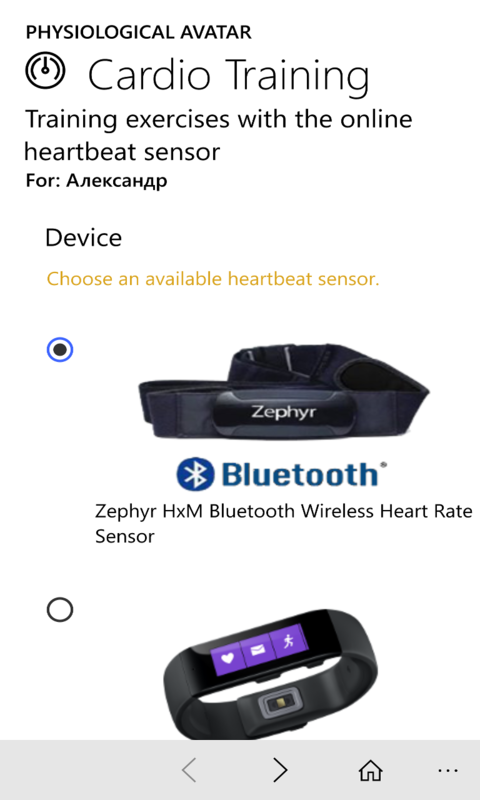 The application can also be used by trainers of fitness centers and simply by people seriously engaged in fitness, as a professional supplement to the famous fitness trackers. Logging of the achieved sports results for each athlete. 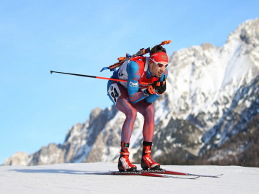 The journal of sports results is created on the basis of sports competitions or special test exercises - estimations. 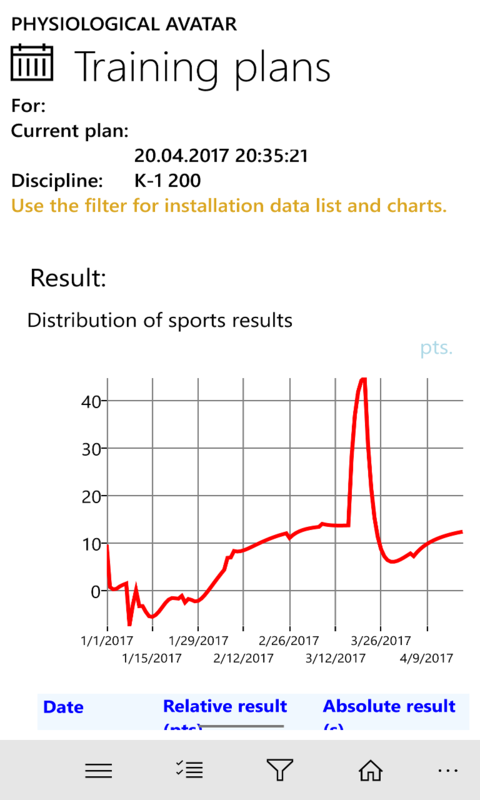 The sports result is measured as an expert evaluation in relative units (points) in the range from 0 to 100 regardless of the sport and discipline. In this case, the value of 100 should correspond to the highest world achievements in this sport and sport discipline. 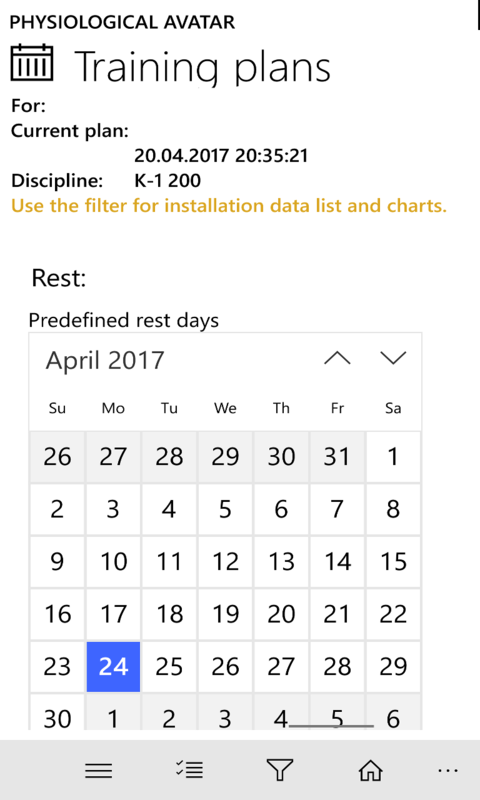 Logging the amount of training load for each athlete. 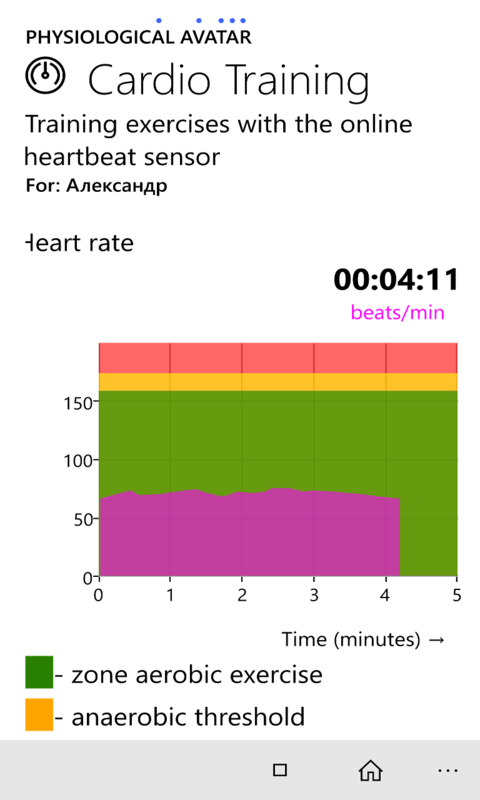 The volume of the training load is measured by the value of the training pulse. 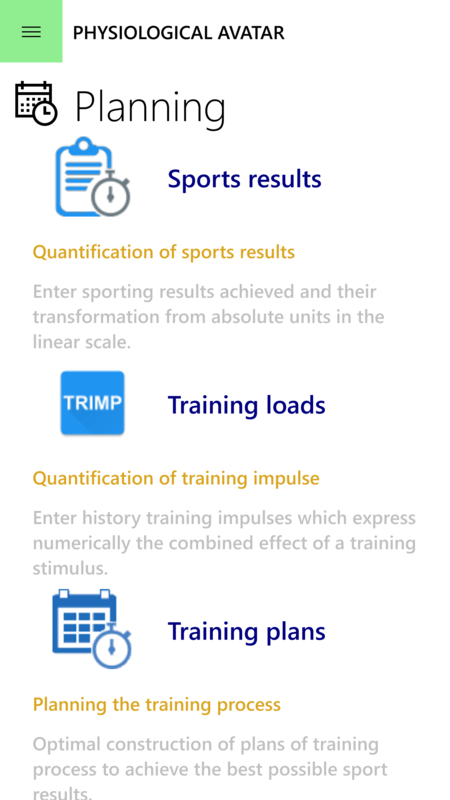 Training impulses (TRIMP) express in numerical form the cumulative effect of the training stimulus. Optimal construction of training process to achieve the highest growth of sports results on the basis of the calculation method of training. More about: Optimal planning of the training process . 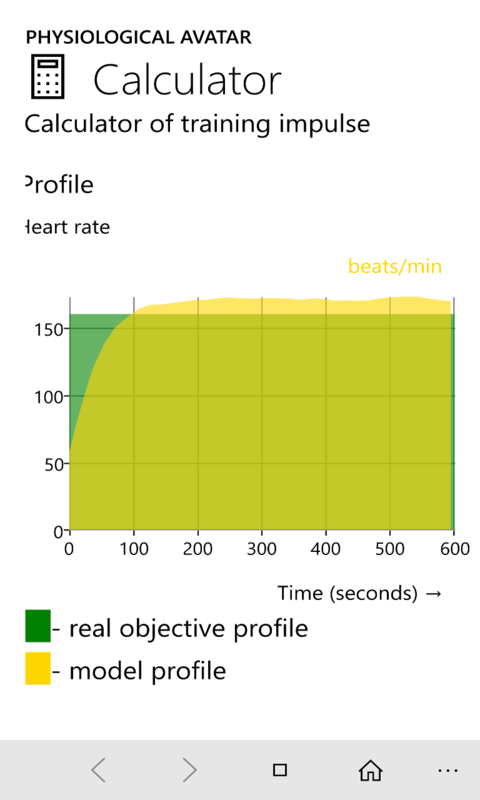 The training impulse calculator, based on the technology of the physiological avatar, allows for the calculation of training impulses (TRIMPs) on Banister for an arbitrary cyclical sport. 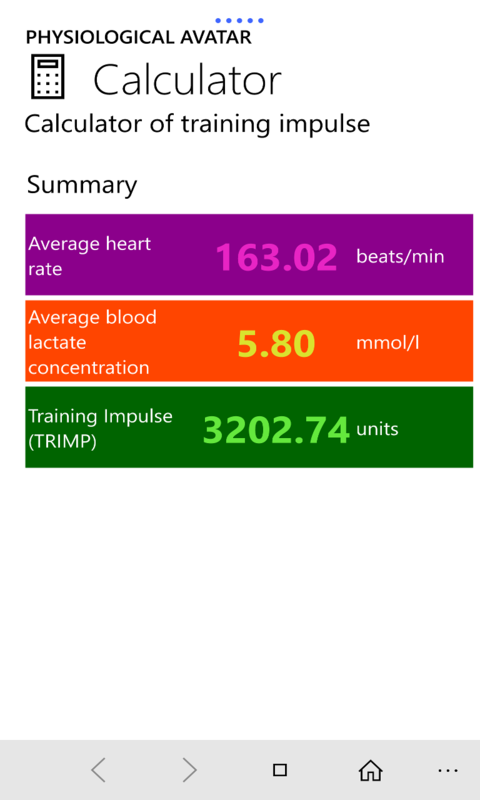 This calculator is a tool for calculating of TRIMP received by an athlete during the heart monitoring process. 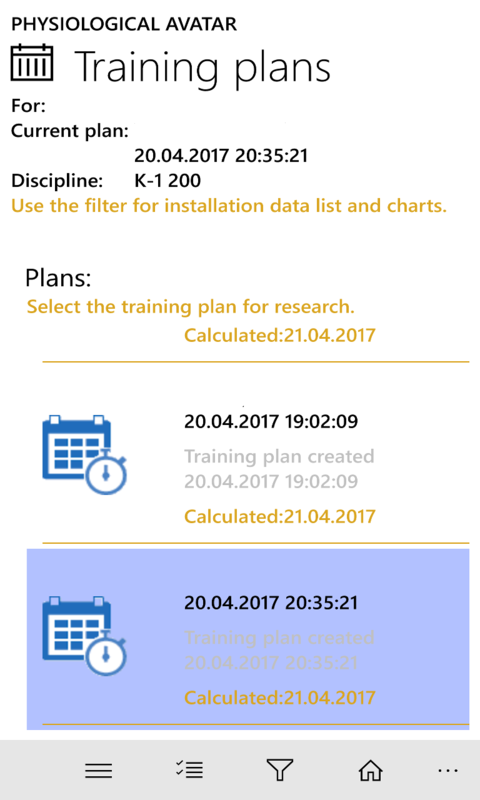 This tool is a tool for obtaining baseline data for optimum planning of a training process. 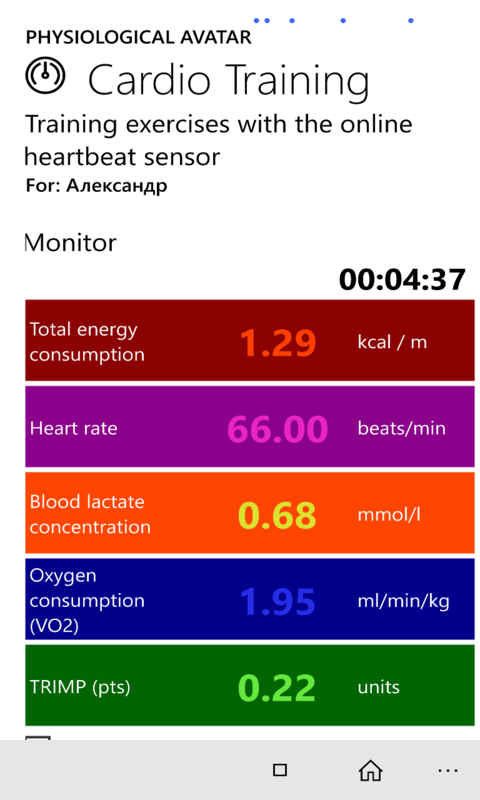 More about: Training Impulse Calculator . 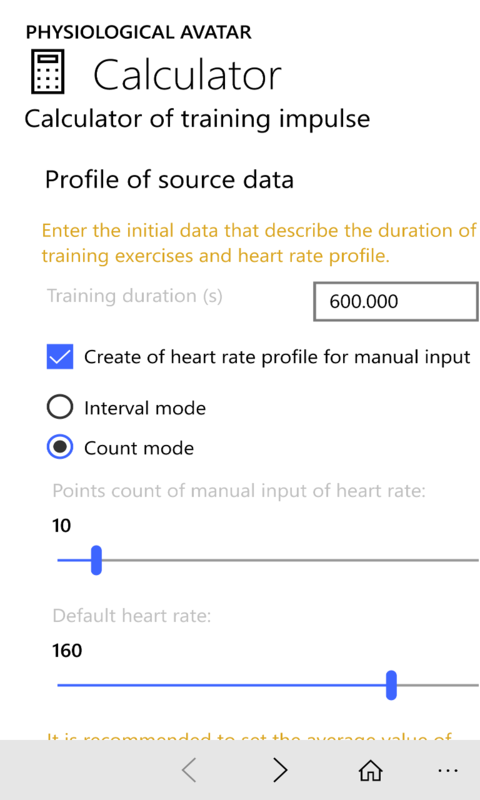 Reverse calculator training impulse based on the technology of the physiological avatar for a given planned value of the training impulse (TRIMP) allows you to calculate the parameters of the training exercise (the duration of the exercise and the pulse) for an arbitrary cyclic sport. 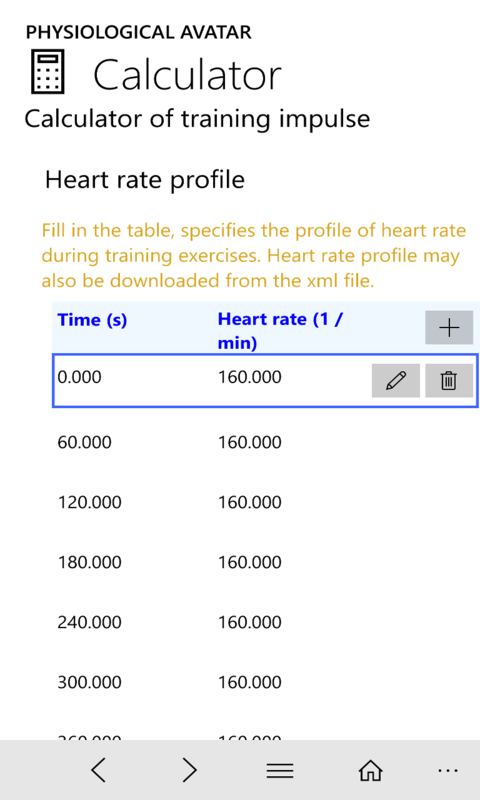 The reverse calculator of the training impulse is an additional tool in the implementation of training plans. 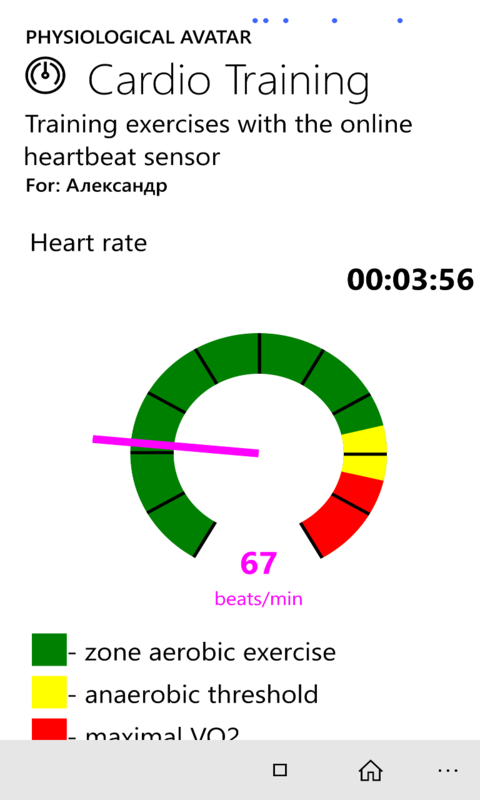 More about: Reverse calculator of training impulse . 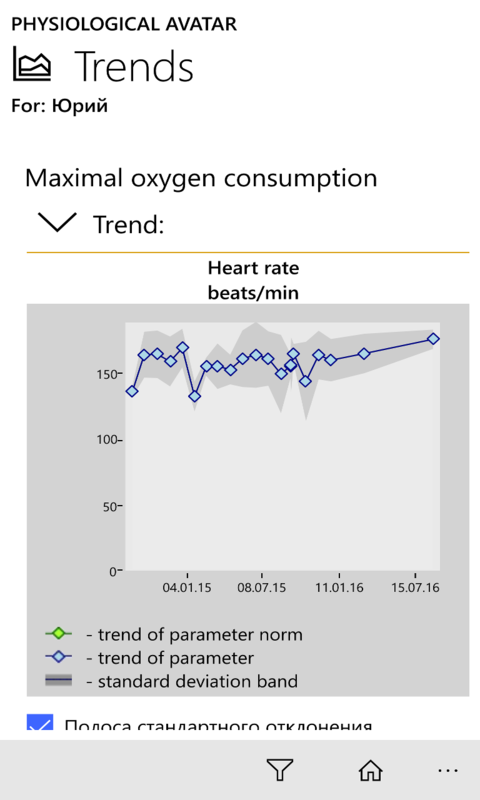 Calculation of training impulse online in the process of training exercises with monitoring of heart rate (cardio training). 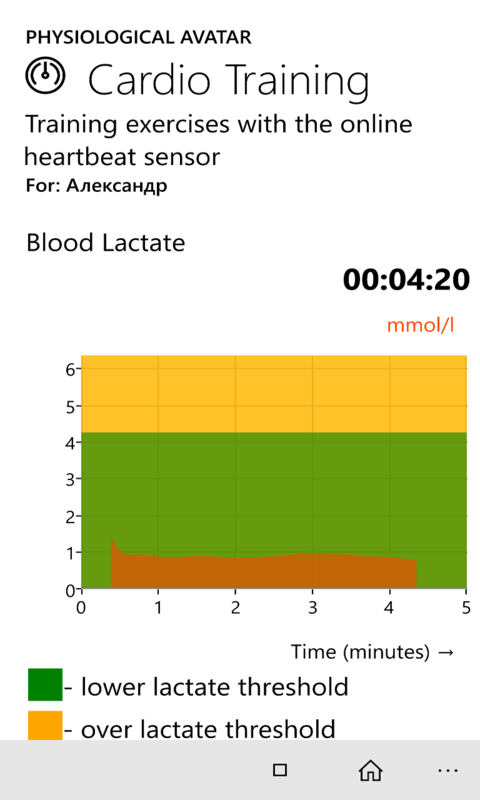 Simultaneously with TRIMP, the level of lactate in the blood and the moments of reaching the anaerobic threshold are monitored. 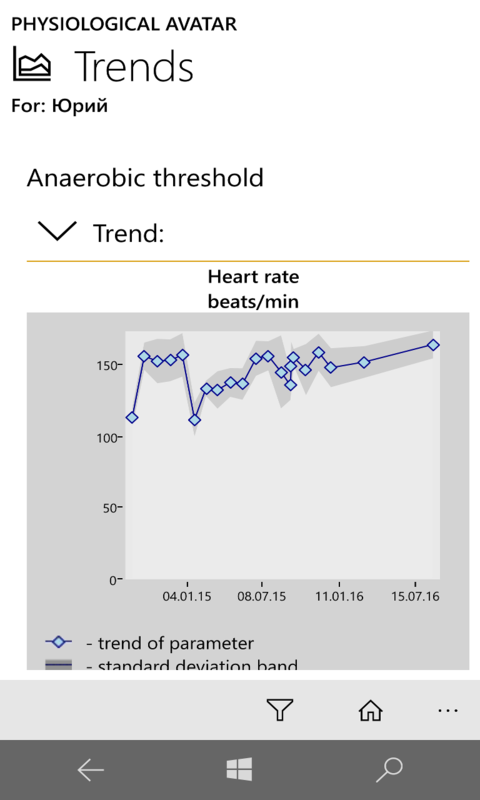 Calculates the training impulse (TRIMP), obtained by the athlete during training with heart rate monitoring (cardio training). 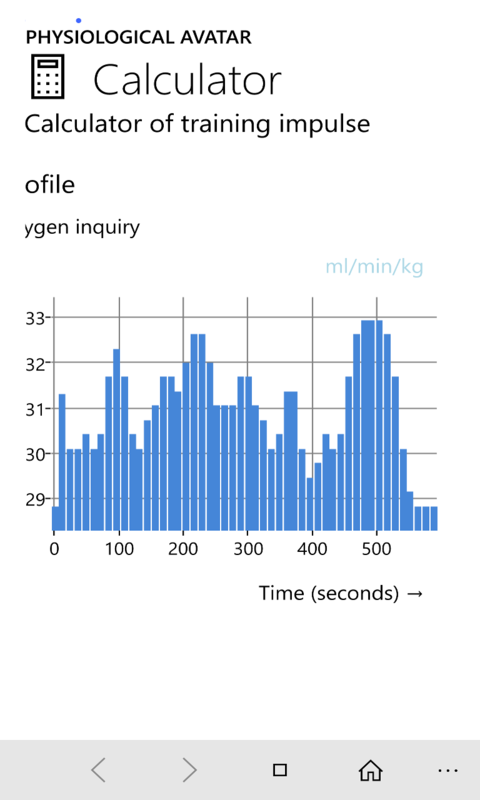 The calculated training impulse is recorded in the diary (journal) of training results. 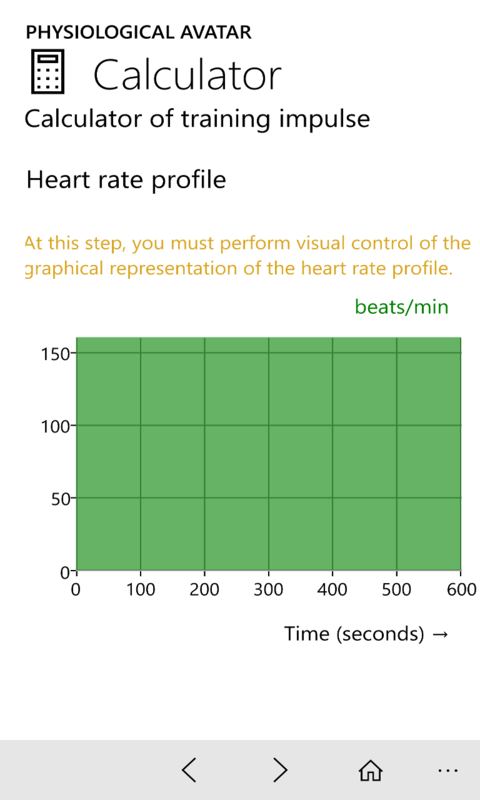 The initial data for the calculation of TRIMP are the duration of the training exercises and the time profile of the heart rate. To determine the model individual lactate profile athlete in calculating the training impulse is used physiological avatar athlete. 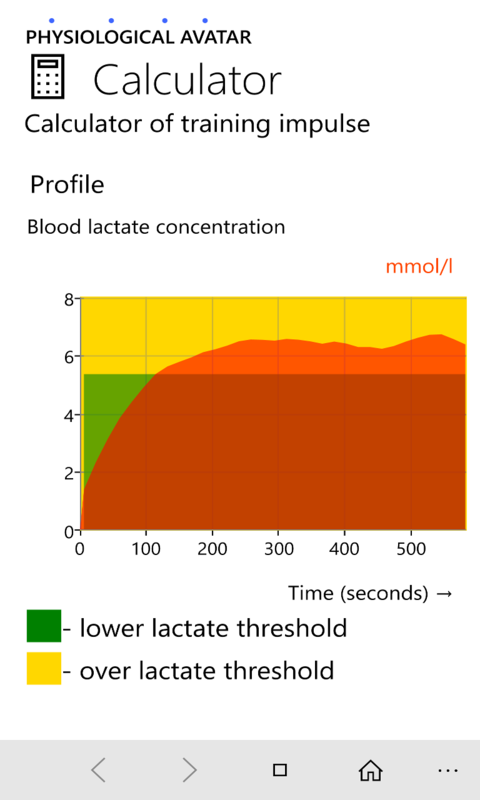 The individual lactate profile is used as the basic mathematical model for calculating TRIMP. 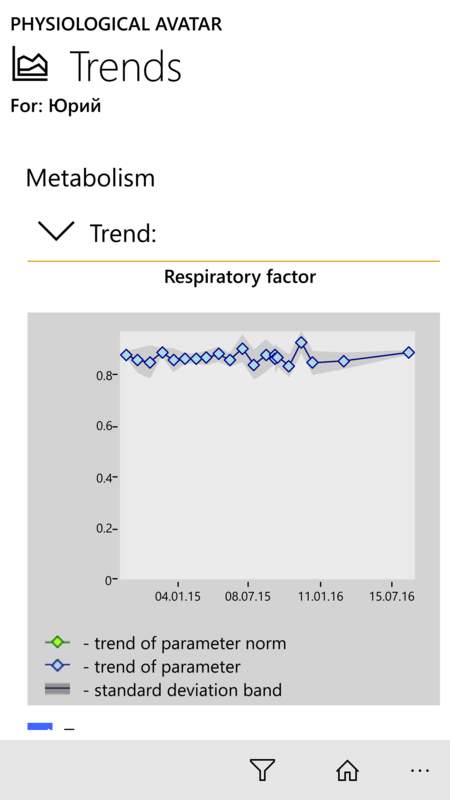 Analysis of the change in time (trend) of those physiological parameters of the organism, which are characteristics of the athlete's functional state. 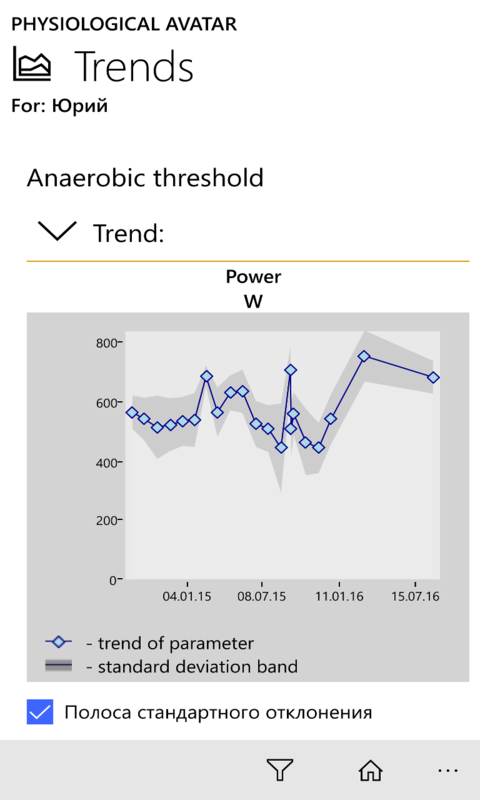 Trends are formed for a given period of observation based on the collection of physiological avatars (PhA) of the athlete. The collection of PhAs must be created in advance by performing the identification procedure for the collection of observations of the athlete's physiological parameters. Having a Microsoft Account for accessing the Windows Store app store or a Google account for accessing Google Play or an Apple ID for accessing the App Store. 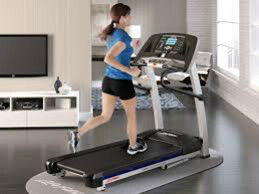 Access to modern laboratory of Sports Medicine for the opportunity to make the necessary medical tests. 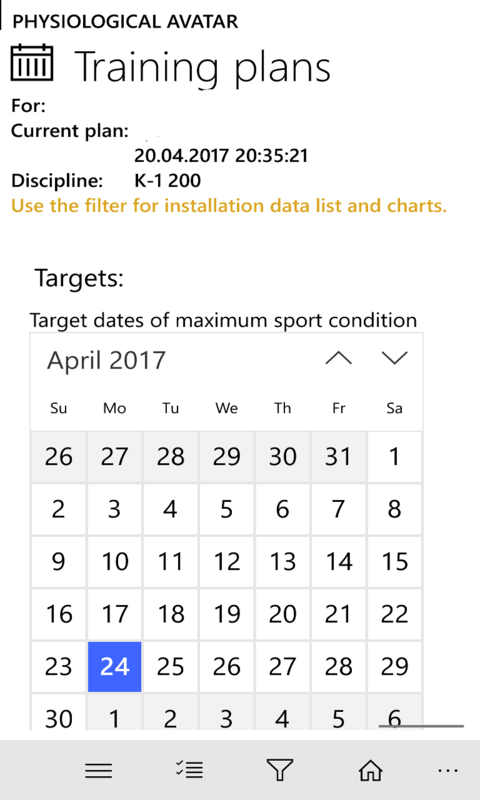 Anyone wishing to use the Kayak Rowing and Canoe Trainer Toolkit application can install it on their device from the Windows Store ,Google Play and App Store stores.